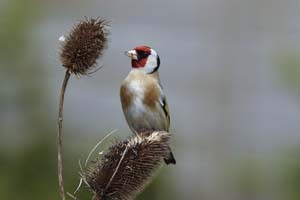 Goldfinch on teasel by Mark R Taylor. These FAQs were put together to answer the most common questions. Can I record on more than one day? Yes! One of the things we’re interested in is how feeding behaviour changes throughout the winter so please make regular observations if you want to. However, please do not make more than one submission a week. I don’t feed the birds. Can I still take part? Yes. We’re interested in why Goldfinches are using gardens in the winter so the fact that you do not provide supplementary food is still important. I don’t get Goldfinches in my garden – can I still take part? We’re only interested in Goldfinches for this survey. However if you are interested in recording the birds in your garden, why not take part in the Garden BirdWatch survey? Why do you need to know my name, email address and postcode? Your name and postcode will help us to identify your garden from others that might be in the same postcode. It also helps us to group together multiple observations (should you make them) from the same gardens and look at how feeding habits vary throughout the country. Your email address is needed in case we want to ask you about your observations. I already do Garden BirdWatch, should I still take part? Yes. The information that we need for this survey is quite different to GBW as we want to find out specifically what foods Goldfinches are choosing to use - this is not something we can determine using the GBW data that you regularly submit. I've forgotten my Garden BirdWatch login details - do I need them for this survey? As this survey is open to the public and we don't want to make everyone register with the BTO, you don't need your login details to take part. We are simply asking people to enter their name, email address and postcode, which will enable us to identify multiple records from the same address. What will the BTO do with these results? These results will be informing BTO research that is examining the drivers and consequences of supplementary food use in Goldfinches. Initial findings will be relayed to participants via email and BTO publications. We aim to publish the complete findings in a peer-reviewed scientific journal. I enjoyed recording the birds that I saw in my garden. How can I do more? By joining the BTO Garden Birdwatch scheme.